Jimmie Vaughan was telling me stories about Jerry Byrd last week and it got me to thinking about the time I wrote to him in 2002. I was going to be in Hawaii and was hoping to meet him and/or hear him play live while I was there. But--as you'll read in the letter--I was a few years too late. 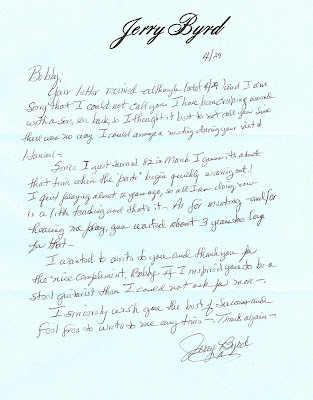 When I returned home, I received this handwritten letter from my biggest steel guitar idol.